Year 6 students Charli Trichet, Nina Kpeda and Bryan Tay, Picture: Andrew RitchieThey can be used as fire-staters, long burning paper bricks for the fire and also sell them to the community. YEAR 6 students from a Balga school are stopping their worksheets and paper going to landfill by turning them into ‘eco bricks’. 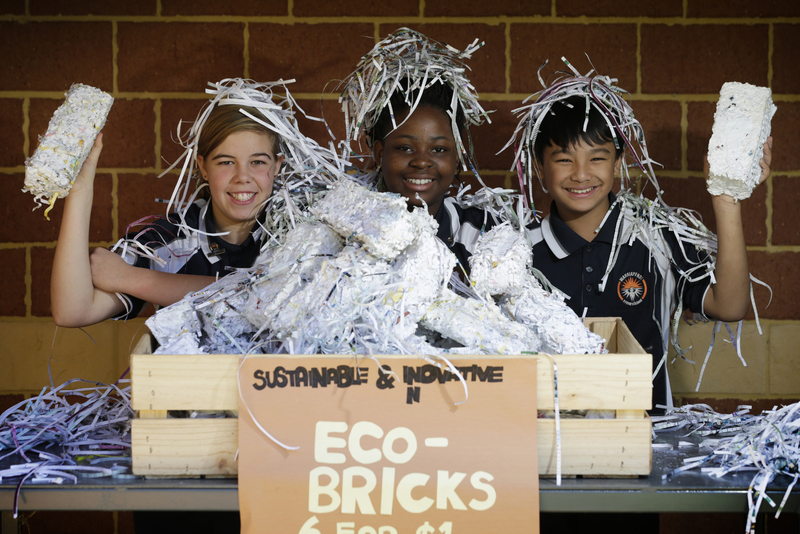 Students from Warriapendi Primary School in Balga are doing their part for the environment by collecting paper bound for the bin and making eco-bricks after their teacher Barbara Astone bought an eco brick maker online. “Last year we identified that there was a lot of waste at the school, then we decided we had to do something about that,” Ms Astone said. Ms Astone said the students could not keep up with demand for the bricks, which they sold to parents and the wider community. “We’re saving the money up which will go towards our end of year graduation camp,” she said. Student Nina Kpeda said her grandmother was a top eco bricks customer. “My grandmother buys six bags of them and breaks them in half and puts them in the fire; she cooks fried rice and our cultural food from Ghana on a cooking pot outside,” she said. Ms Astone said the school also had its own garden which used recycled food waste from the canteen in compost bins and worm farms.